Britain’s biggest snowflake is to land in the heart of Liverpool next week – as part of a magical Christmas extravaganza. The 8-metre high illuminated feature will be unveiled on Thursday, 19 November 2015 to launch a city centre wide Snowflake Trail. The mammoth snowflake will be in Williamson Square with 12 other 1.5m high snowflake sculptures, specially designed by artists from across the UK, placed in key locations. A total of 100,000 trail maps will be distributed and made downloadable inviting everyone to discover the snowflakes and solve the trail’s puzzle, with a chance to win a series of amazing prizes worth more than £5,000. The main prizes are a ‘money can’t buy Liverpool weekend’ for four people, staying at Hotel Indigo, and for a home to be decorated next Christmas to the value of £1,500 by Liverpool firm, the Christmas Decorators. There are also prizes from Everton FC and Liverpool FC as well as family panto tickets and a bespoke silver Snowflake Pendant by Wongs the Jewellers, worth £350. Bill Addy, Chief Executive of Liverpool BID Company, which devised Liverpool’s biggest free festive event, said: ‘’The Snowflake Trail has been created to give visitors a unique Christmas experience in Liverpool city centre. ‘’It’s going to take people on a magical journey discovering wonderful works of art in beautiful locations. We’ve been thrilled watching the artists have transform the snowflake sculptures. A limited edition version of the trail map will also feature a new story specially commissioned for the six week event, called ‘The First Snowflake’, which focuses on a 10-year-old boy – called Alfie – who goes on an adventure with Jack Frost. A giant 2.5-metre wide book featuring the story’s opening chapter will sit next to the giant snowflake in Williamson Square, opposite the Liverpool Playhouse theatre. 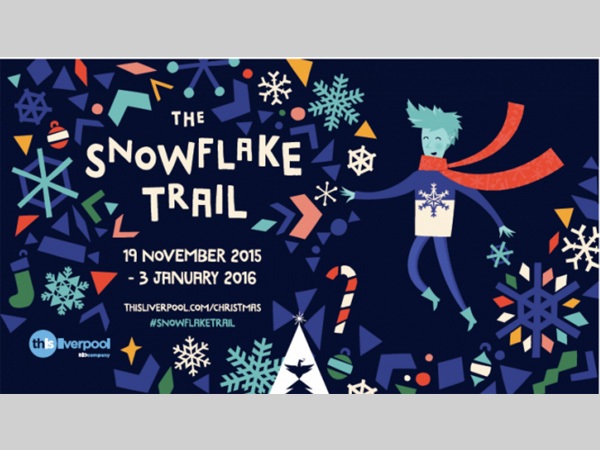 The Snowflake Trail, which runs until Sunday, 3 January, is a free event and a key highlight of Liverpool’s One Magical City campaign, which launches on Friday, November 13. The trail also features a series of specially devised light and sound installations that will create swirling snowstorms in several city centre streets, while smart phone users can use an augmented reality app to bring the map and selected window displays to life. Charlotte Corrie, director of arts organisation Open Culture, creative producers of The Snowflake Trail, said: ‘’Rather than have one spectacular event on a single night, we wanted to use Liverpool as a theatrical stage to be enjoyed over the whole festive period. Using light, sound and sculpture The Snowflake Trail is designed to transform the city centre into an atmospheric celebration of winter and all the Christmas magic that it brings.